The film follows the scientific exploration of Challenger Deep, the deepest place on Earth, with information collected over a series of dives by a manned submersible. On one dive, Cameron himself, rode solo in the submersible, named the Deepsea Challenger, to a depth of nearly seven miles beneath the ocean’s surface. National Geographic and Rolex were partners in the dives. For this expedition, Cameron squeezed into a pilot sphere so small he could not extend his arms. He was the sole occupant in a complex, 24-foot-long (7.3-meter-long) craft made primarily of highly specialized glass foam. 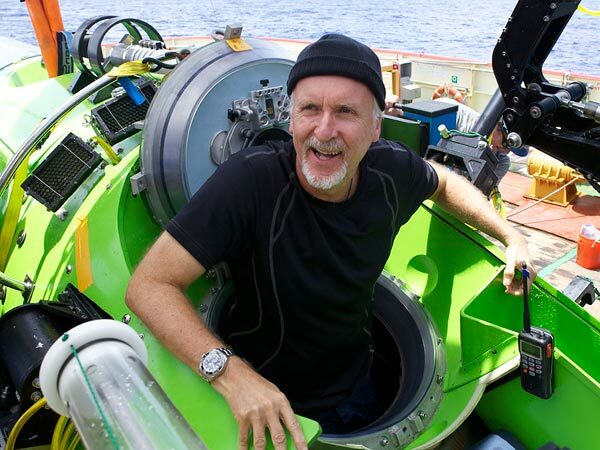 As he maneuvered on the ocean floor amid unexplored terrain and strange new animals, Cameron filmed footage for this documentary and collected samples for historic research. The film will hit theaters August 8. If I were picking where to see this doc, I would pick an IMAX theater. Me and my kiddos are checking this one out, we’re all big fans of ocean exploration. My interest began with a deep love for Steven Spielberg’s ‘Jaws‘, of course I shared this with my kids, probably while they were too young. That would explain why I have beautiful childhood drawings from each of them depicting a shark eating me when they were angry with me. My son’s drawing not only showed ‘Jaws‘ eating me, but featured floating body parts and copious amounts of blood. These kids will have plenty to share with a therapist one day! This entry was posted on Friday, May 9th, 2014 at 10:44 am	and is filed under Film, News. You can follow any responses to this entry through the RSS 2.0 feed. You can skip to the end and leave a response. Pinging is currently not allowed. « Interview: Doug Bradley at Texas Frightmare Weekend 2014!! Allow me to introduce myself. Rodney Skinner, gentleman thief. Now, I thought invisibility would be a boon to my work. Well, you can imagine, it was my undoing. Once you're invisible, it's bloody hard to turn back.